A few weeks ago, in writing a thing about the Bears, I noted that they have historically been linked with defense more than any franchise has been linked to a single facet of the game, noting the Saints and their offense as a runner-up in that competition. Before publication, I removed the reference to the Saints, because it just wasn’t true. Before Drew Brees’ arrival in New Orleans, the team was really just linked to being bad. It was Brees, not some historic level of offense, that made the Saints a scoring powerhouse. But Brees predates our decade span here, so for our purposes, yes, the Saints are and have been an offensive marvel. They won the Super Bowl in 2009, the first year of our sample, and have made the playoffs six times over the 10 years, winning at least seven games every year and being maybe the single best team in the league in 2018 before a heartbreaking NFC Championship Game loss. Historically, it’s not an offensive juggernaut. In recent history? No team is more of one. Let’s take a look at the best Saints fantasy seasons of the last decade. The Patriots have the reputation as the team that hates your fantasy team because of their usage of running backs, and it’s not entirely undeserved — guessing which Patriot running back will be the team’s scoring leader in a given week or season has often been an exercise in futility. But the Saints aren’t far from that. The thing that sets New Orleans apart in that regard is their raw total — the Saints have the most RB fantasy points over the last decade by almost 800 over second place, or 80 points per season — but before 2017, Darren Sproles in 2011 was the only back to top 250 points over the last decade. The team has had monster running back performances, but it’s generally been spread around. Kamara, though, has changed that. He and Mark Ingram split things in 2017, but with Ingram suspended to start 2018, Kamara took charge, and put up the best season for a Saints running back not named Kamara over the last decade by almost 80 full points. 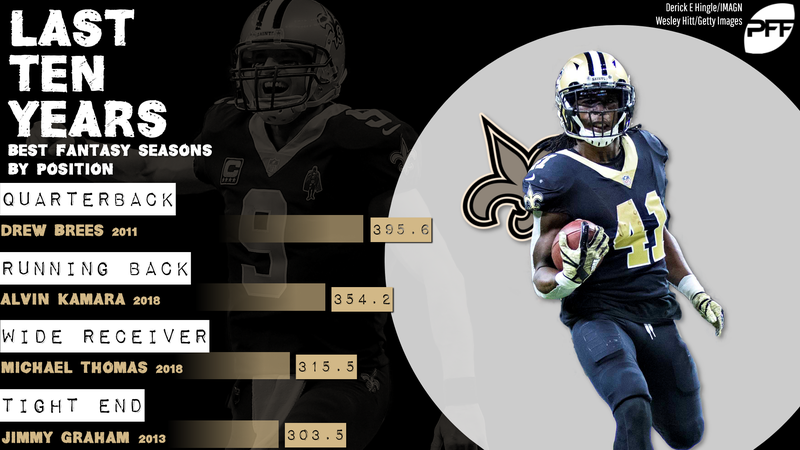 Just like running back, the Saints have had no trouble putting up big performances from its receivers on the whole over the last decade, but individual numbers lagged a big. The top nine on the list over the last decade are all Thomas (Nos. 1-3), Marques Colston (Nos. 4, 7-9), and Brandin Cooks (5-6), but Thomas’ 2018 is the only season on the list to top 260 points, and he did so by a wide margin. He’s the only receiver for the Saints to top 1,200 yards in our timeframe, reached 1,245 in 2017 and 1,405 in 2018. He remains one of fantasy’s top receivers heading into 2019. Counter to running back and receiver, the Saints had no problem getting dominant performance from tight end, but really just Graham, who finished first or second at the position in PPR scoring every year 2011-2014. He was never better than in 2013, when he had a whopping 16 touchdowns, but his 2011 was close, with 13 more receptions and nearly 100 more yards. The Coby Fleener/Benjamin Watson era obviously hasn’t gone as well since Graham’s departure, but then it hardly could have.